Welcome to Airborne Roofing, your South Jersey roofing authority. From residential services to commercial roofing, our highly experienced roofing contractors look forward to helping you. Contact us at (856) 662-1382 for more details about our professional roofing services! Airborne Roofing has been in Business for Over 45 Years! For more than 45 years, Airborne Roofing has served the homes and businesses of New Jersey with the highest quality roofing services. You will not find many other roofers with the extensive experience and certifications our team has. We are proud to hold an A+ rating with the Better Business Bureau, and we are a GAF Preferred Installer and a Mule-Hide Preferred Contractor. When you choose Airborne Roofing, you can rest easy knowing that you are getting top quality service from highly skilled professionals. 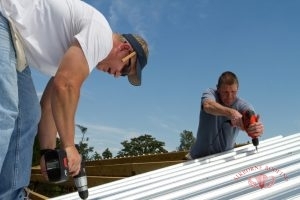 In addition to residential and commercial roof repair and replacement, we also provide home exterior repair and more. Because your gutters and other components are essential parts of your roof system, we work hard to ensure that your home or business is in top shape. Our roofers believe in providing the best service, so we don’t hurry through a job or cut corners. The team at Airborne Roofing is committed to your satisfaction, so don’t hesitate to give us a call or ask questions. We are happy to help you find the right roof for your building and tell you about the different solutions we can provide. Call our experienced roofing company today at (856) 662-1382 for professional service in Berlin and Cherry Hill, NJ! Updated on September 21, 2018 at 2:31 pm by Airborne Roofing.